What’s Behind the New China-ASEAN Maritime Exercise? The fact that an old idea is finally set to become a reality reflects broader changes underway in the region. This week we saw another round of hype surrounding the holding of the first ASEAN-China maritime exercise. Although the idea is far from new, the very fact that it is being scheduled for this year is testament to broader changes that have been underway over the past few years, both in the region more broadly as well as in terms of the South China Sea more specifically. The idea of an ASEAN-China maritime exercise is far from new. 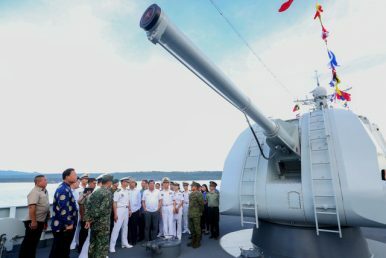 As I have noted before, China first officially proposed it at the holding of the inaugural ASEAN-China Defense Ministers’ Informal Meeting (ACDMIM) back in October 2015 as one of several ways to boost security cooperation between the two sides (See: “The Truth About China’s New South China Sea Drill Proposal with ASEAN”). At the time, the reception towards the proposal at that time was mixed at best. With it being tied to the South China Sea and the developments underway there, it was rightly viewed as just one manifestation of part of China’s broader strategy of “incremental assertiveness,” where small conciliatory gestures are periodically rolled out as part of a calibrated effort to offset far more destabilizing actions, be it its building of artificial islands in the South China Sea or the pressure placed on Southeast Asian states perceived to be “troublemakers” on this question and encouraging external intervention in the disputes. But the idea began to gain traction last year in particular after a long gestation period. Part of this was due to a temporary change in Chinese tactics in the region, including in the South China Sea. In the context of warming of Sino-Philippine ties under Duterte after the ruling of the Permanent Court of Arbitration (PCA) in July 2016, the relatively greater regional focus on other security issues like terrorism and North Korea, opportunities for more of a “charm offensive” following the regional uncertainty after Donald Trump’s election as well as new initiatives like the Belt and Road Initiative (BRI), and with its own Party Congress approaching in November, it made sense for Beijing to trumpet another temporary “cooling down” period in the South China Sea in 2017. In fact, as I noted repeatedly last year, 2017 was far from cool in the South China Sea, and China continued building up its capabilities in the South China Sea as well as pressuring individual ASEAN countries (See: “Beware the Illusion of South China Sea Calm”). Nonetheless, in the context of the softening of the Philippines’ own South China Sea position under Duterte (which predictably generated reverberations across the region); strong-arming by Beijing; and uncertainty about the United States’ own role in the region, we saw a predictable pattern where some Southeast Asian claimants took their own actions to secure their interests even as ASEAN and China moved forward on some confidence-building measures such as a framework for a code of conduct on the South China Sea (See: “Will a China-ASEAN South China Sea Code of Conduct Really Matter?”). Given all this, it was no surprise when at the Shangri-La Dialogue last year, Singapore’s Defense Minister Ng Eng Hen announced in his speech that the first ASEAN-China maritime exercise would finally be held in 2018 under Singapore’s chairmanship. As I noted then, though it was striking that Ng did not mention the South China Sea even once in his speech, apart from the fact that the drills were one of several confidence-building measures Singapore would advance, the omission and the willingness to include the drills on the agenda also partly reflected the aforementioned regional trends as well as the city-state’s own struggle to manage its relationship with China amid increased strong-arming by Beijing (See: “Singapore Unveils New ASEAN Defense Initiatives Ahead of Chairmanship”). This week, the exercise was again in the news following an informal meeting between Chinese Defense Minister Chang Wanquan and ASEAN defense ministers in Singapore on February 6. In remarks at the meeting, Chang, who was in Singapore for an introductory visit from February 4 to 8, framed the initiative in terms of the wider context for deepening ASEAN-China defense ties and the formation of an ASEAN-China community of common destiny, a usual Chinese talking point that is advanced in the ASEAN-China context. Despite the media headlines, few specifics were provided about the nature of the exercise itself, which, as I have pointed out before, will be important indicators of its true significance. When it was first broached, indications were that it would be quite limited in scope – involving areas like maritime search and rescue and disaster relief – and that it would not be without its challenges, whether it be the lack of trust or where exactly they will be conducted (especially in the case of the South China Sea given the areas with contested claims). Few of those parameters have changed today. There have been no official details released about the exercise, with preparations still to be made to work out specifics. But Kyodo News quoted unnamed ASEAN sources as saying there would be two exercises held this year under the “ASEAN-China Maritime Exercise” – one would be a tabletop exercise in China, possibly in October, and another being a field training exercise in the waters of an ASEAN member state, potentially the Philippines, in late November or December. Irrespective of how those specifics play out, when it occurs, the holding of the exercise itself will be a testament to broader changes underway in the region in general as well as in the maritime realm. Advances at a recent meeting are much more modest than suggested and conceal the significant challenges that remain.